With my Birthday just a week away. Birthdays, in general, are on my mind. This post has actually been running around in my head for a few months. But with my birthday fast approaching it seemed like a great time to get it published. Because I put so much value into birthdays. I thought it would be great to let you in on why birthdays are important, at least in my eyes. Birthdays celebrate a whole new year in this amazing place we call life. You’ve been through one full year full of up’s, downs, and countless adventures. You are alive. Feel proud of whatever age you’ll be turning and state it with no quivering voice. For you are amazing and birthdays are to be celebrated! Gather your friends and family and throw a party. Even better take a full weekend, or week and celebrate you. Because we deserve to be celebrated, loved, and surprised on our birthday. Do you feel like you never remember people’s birthdays? Do you only remember when that little facebook notification pops up saying it’s so and so’s birthday? 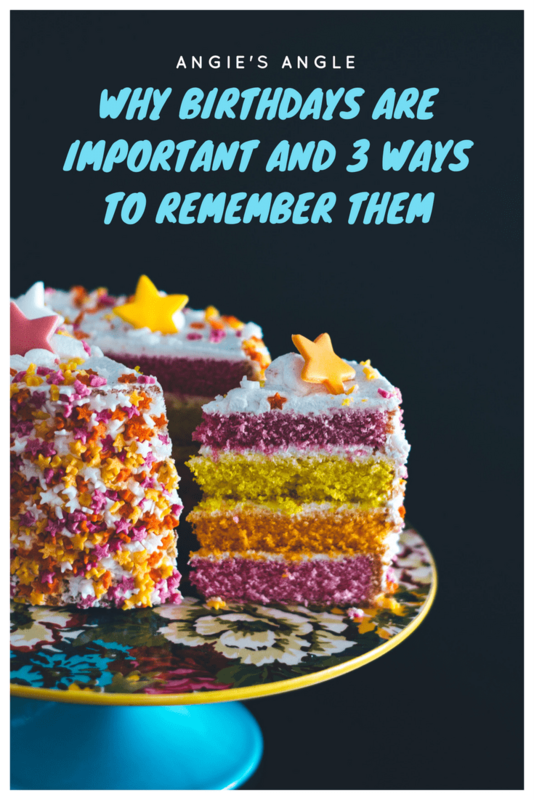 These are three ways you can remember them. So you can help celebrate all those amazing milestones in those you care about around you. It may sound old fashion and out of date. But you’d be amazed at how much more you remember if you buy a wall calendar for the year. At the beginning of the year put all the special birthdays and even anniversaries on it. Anything you want to remember and celebrate. Put it somewhere you are at daily. For instance, our main wall calendar is on the wall by our coffee pot. That way each morning when I go to make my cup of coffee it’s right there facing me. Plus you’ll hopefully have a full month before a special date to remember it and buy something for it or plan something for it. You are going to think about that more than you would a calendar on the phone. Yes, I just stated that you are likely to look at the wall calendar more and get it into your brain more. But it does help to also put in your calendar on the phone. Put it in there again at the beginning of the year and put a reminder on it. Put a week or two before to remind you it’s coming up. Being able to put a reminder helps prompt you that hey this important date is coming. And yes birthdays ARE important and need to be acknowledged. Be more even more ready and remember by getting 12 file folders. Make one for each month of the year. Go out with a list of birthdays you have coming up and buy those cards in advance. Slip them into the proper month. At the beginning of the month look in the folder and see who you have coming up that month. Not only will you be remembering their birthday by doing this but you’ll be one step ahead on celebrating them and their special day! So go out there and celebrate birthdays and other special days like they should be celebrated. Be ready to wow them by remembering them. If it’s your own birthday, celebrate you. Don’t be ashamed to spoil yourself on your special day. You deserve it. As does everyone else around you.